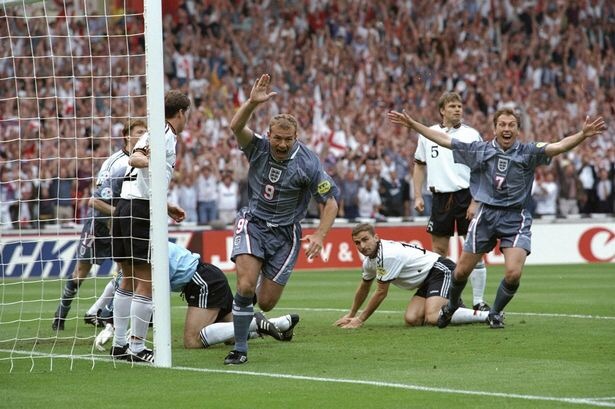 This week marks the 20th anniversary of England playing Germany in the Euro ’96 semi-final. Today we look back at the subsequent international careers of the side that played that night. Euro ’96 saw David Platt start just two matches, having previously been such a major source of goals for England during the 1990s and often worn the captain’s armband. When he scored in the shoot-out against Germany it would turn out to be his last touch in an England shirt, as he would not win any caps under Glenn Hoddle. Platt had scored 27 goals in 62 caps, twice playing in major semi-finals. Like Platt, Paul Gascoigne played in both momentous semi-finals for England in the 1990s. His European Championship was mainly remembered for his great goal against Scotland and near-miss against Germany. Gascoigne had enjoyed regular action under Terry Venables but he would have a more complex relationship with successor Glenn Hoddle, who took over after Euro ’96. Gascoigne played regularly during qualifying for the 1998 World Cup but his international career would infamously end with his omission from the final squad amid fitness concerns – his final cap coming against Belgium in Morocco just days beforehand. He had won 57 caps in a 10-year England career. Euro ’96 saw Stuart Pearce make amends for missing against West Germany in 1990 by scoring against both Spain and Germany in penalty shoot-outs, his joyful reaction to scoring in the former particularly memorable. It seemed to mark the end of his England years, but there would be more caps earned. He played six times under Glenn Hoddle, but his England career again appeared to have ended with his 76th cap against Italy during Le Tournoi in 1997. But two years later he was recalled at the age of 37 to play in European Championship qualifiers against Luxembourg and Poland under Kevin Keegan. This really would mark the end of a lengthy service to England that began in 1987. Midfielder Paul Ince played in four of England’s matches during Euro ’96, only missing the Spain game due to suspension. He continued to play regularly for his country, deputising as captain on several occasions including for the momentous World Cup qualifier away to Italy in 1997 when he played on with his head bandaged up. He started all four games for England at the 1998 World Cup. Having surprisingly not taken one against Germany in 1996 he was second up in the shoot-out against Argentina but failed to score as England lost out. In the next match, a European Championship qualifier against Sweden, Ince became only the sixth England player to be sent off. He went on to win nine more caps over the next two years, finishing his England career by starting all three matches at Euro 2000. In total he won 53 caps. After a barren spell for England, Alan Shearer regained his scoring touch at the right time and was top scorer during Euro ’96. Following the tournament Shearer was installed as captain by Glenn Hoddle, a role he retained for the next four years. He scored five times during England’s qualification campaign for the 1998 World Cup and in the finals netted against Tunisia and Argentina (penalty). Six goals were scored during qualifying for Euro 2000, but prior to the finals he announced he would retire from international football once they were over. He netted the winner against Germany but like Ince his final cap would come in the 3-2 defeat by Romania, a match when Shearer scored a penalty. He had scored 30 goals in 63 caps for his country. England’s captain during Euro ’96 was Tony Adams, who just weeks later would reveal his struggle with alcoholism. He remained in the England side for four more years, but would only occasionally wear the captain’s armband after losing the role to Alan Shearer. He played in all four England matches at France ’98 but only against Portugal at Euro 2000. He wore the captain’s armband for the two matches after Euro 2000 against France and Germany but was never capped again, as his international career that began in 1987 ended with 66 caps. Winger Steve McManaman started all five England matches during Euro ’96, but his appearances would be more sporadic after Glenn Hoddle replaced Terry Venables. McManaman’s only involvement at the 1998 World Cup was a substitute appearance against Colombia, but he would find more favour with Hoddle’s successor Kevin Keegan. McManaman scored in England’s opening match of Euro 2000 against Portugal but he was injured and did not feature again in the tournament. He featured in eight more England matches without completing a full 90 minutes, the last cap coming against Greece in October 2001. In total he played 37 times for his country. Euro ’96 saw Darren Anderton play in all five of England’s matches but he had to wait almost two years to win another cap, playing in a friendly before the 1998 World Cup against Saudi Arabia. During the finals he played in all four of England’s games, memorably scoring against Colombia. Continued struggles with injury unfortunately led to the ‘Sicknote’ tag spreading and his last five caps would come under five different managers (including caretakers) between 1998 and 2001. He played no part in Euro 2000 and his 30th and final cap was earned against Sweden in November 2001. Striking up a successful partnership with Alan Shearer during the tournament was 30-year-old Teddy Sheringham, who had been a relative latecomer to the international scene but would serve his country for a further six years. He started England’s first two games at the 1998 World Cup under Glenn Hoddle but earned just one cap during Kevin Keegan’s time in charge as he missed Euro 2000. But his international career wasn’t over yet and he would go on to score as England drew 2-2 against Greece to qualify for the 2002 World Cup. During the finals he started four matches, his 51st and final cap coming as England lost to Brazil and went out of the tournament. Goalkeeper David Seaman enjoyed a successful tournament, saving a penalty during England’s win over Scotland and then helping win a shoot-out with Spain. Seaman remained first choice goalkeeper for six years, appearing in every match they played at the World Cups of 1998 and 2002 and two games at Euro 2000 – missing the decisive defeat by Romania due to injury. Seaman was left tearful after being deceived by Ronaldinho’s winner for Brazil at the 2002 World Cup but did not retire from international duty, taking goal for European Championship qualifiers in October 2002 against Slovakia and Macedonia when aged 39. He took the blame for another goal conceded in the latter and it marked a sad end to his England career, which had produced 75 caps over 14 years. 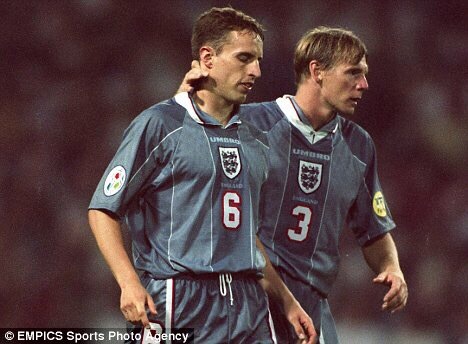 Euro ’96 saw defender Gareth Southgate begin to establish himself at international level, although many would sadly remember his involvement in the tournament for missing in the shoot-out against Germany. He remained prominently involved under Glenn Hoddle, although his only matches at the 1998 World Cup were against Tunisia and Argentina – the latter as a substitute. During Euro 2000 he was restricted to just a substitute appearance against Romania, broke surprisingly being deployed as a holding midfielder during Kevin Keegan’s final match against Germany in October 2000. Southgate remained involved under Sven-Goran Eriksson without starting regularly, not getting any gametime at the 2002 World Cup. His 57th and last cap was won against Sweden in March 2004. Of the rest of England’s squad, Steve Howey and Steve Stone were never capped again. Tim Flowers earned three more caps during the next two years, the same year as Les Ferdinand last represented his country. Jamie Redknapp’s England career continued to be affected by injury and he last appeared in November 1999 at home to Scotland. Nick Barmby was part of the England side that beat Germany 5-1 in September 2001, but his last cap was won the following month against Greece. Robbie Fowler’s England career perhaps never took off as he hoped, his only other involvement in a major tournament being a substitute appearance against Denmark at the 2002 World Cup which marked his final cap. Perhaps the strangest case in the England squad was Ian Walker, who won just two more caps in 1997 and 2004 – the latter coming just before he went to Euro 2004 as a reserve goalkeeper. However, far more prominently involved were the young defensive trio of Sol Campbell and brothers Gary and Phil Neville – each continued to represent England until 2007, Campbell being the last member of the 1996 squad to be capped when he turned out during the defeat by Croatia. 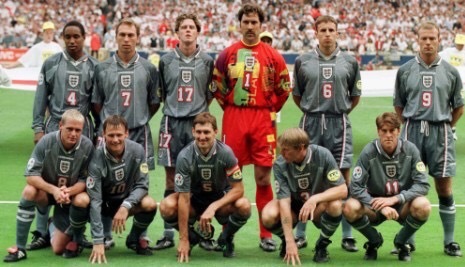 England, Euro 96, Germany, Squad, What Happened Next?